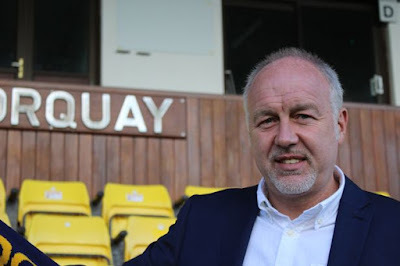 After a protracted recruitment process (over 3 weeks, in which the Gulls played 6 matches since the sacking of Kevin Nicholson), Gary Owers has been appointed as Head Coach (manager) of Torquay United. Gary Owers played for Sunderland (appearing in the 1992 FA Cup Final) and also played for Bristol City; Notts County; Forest Green Rovers and Bath City. He became a player-coach at Bristol City before starting his managerial career at Forest Green Rovers in 2005. He joined Aldershot Town as assistant manager and helped guide the team to tge League 2 play-offs. Gary Owers will need to call upon all of that experience as he joins the Gulls after a disastrous start to the 2017/18 season. After 10 games the Gulls had yet to win. Gulls fans everywhere will welcome Gary Owers to Plainmoor and will hope that he can orchestra a change in the Gulls fortunes after a tumultuous few years. On Saturday 29 April 2017, once again Torquay United went into the final game of the season fighting against relegation. Showing grit and determination, the Gulls recorded their third consecutive victory to save themselves the indignity of slipping into regional division of lower league football. In doing so, Kevin Nicholson and the players had to overcome a season full of off-field turmoil. After years of mismanagement a prolonged takeover (initially announced on 20 December 2016 but not ratified until 27 February 2017) of the club was completed by Gaming International. On one hand we should be grateful to Gaming International as it was only loans that they made to the club, that saved Torquay United from administration and the inevitable associated points deduction. However, in saving their status in the National League, a lot of supporters are left wondering if it is a case of out of the frying pan and into the fire. Gaming International (GI) purport to be a company for the management and operation of greyhound and speedway racing tracks, but really appear to be property developers and responsible for a series of failed plans to develop new stadiums. Clark Osborne – the owner of GI and current chairman of Torquay United – was a director of Bristol Stadium PLC who in 1986, forced Bristol Rovers (through rent increases) out of their Eastville Stadium before selling the stadium to IKEA. The plan at that stage was to build a new greyhound stadium but that never came to fruition. Instead they moved the greyhound racing organisation from Bristol to Swindon. However, in 2014, announced that planning permission had been granted to build houses on the Swindon greyhound track. Again, the plan was to build a new stadium, but three years later there is still no sign of the stadium being developed. A similar experience has taken place at Reading. This time Gaming International took over the greyhound and speedway stadium, announcing plans to build a new stadium and casino complex. However, they then shutdown the Reading Racers speedway team. In 1995, GI took over Poole Stadium PLC and the running of the greyhound racing and speedway team based there; the stadium being the former home of Poole Town football club. Poole Town have turned around their fortunes this year and have been chasing promotion into the National League. However, for Poole Town to progress they need a stadium that is compliant with the league standards. Despite expressing an interest in hosting Poole Town, GI as yet have announced any plans to help the football club back to their former home. In the case of Torquay United, the announcement of taking over the club was tied into the prospect of developing a new stadium and GI are believed to have been involved in discussions with the local council to take over the freehold of the Plainmoor Stadium. The next few weeks will be crucial for the future of Torquay United, and what supporters can expect from the new owners. The club is in desperate need of investment for it to start working its way back up the football league pyramid. With so much uncertainty and rumours facing the club, GI must be seen to publicly back the club financially and through their interaction with fans. One thing is certain… it is never dull being a Torquay United supporter.